An importance of Aadhaar Card and Aadhar Number is increasing dramatically. As per new rule, Aadhaar card is made as mandatory document along with PAN card for Income tax and banking purposes. In addition to that, 5 new rules related to Aadhaar card and banking is added. These new rules will help the government to increase tax compliance, it will also help to control black money. Let’s take a look at 5 new rules for Aadhaar card and its effect on your financial life. PAN card & Aadhaar card linking – As per new rule dated 15th June, 2017, it is mandatory to link Aadhaar with PAN. 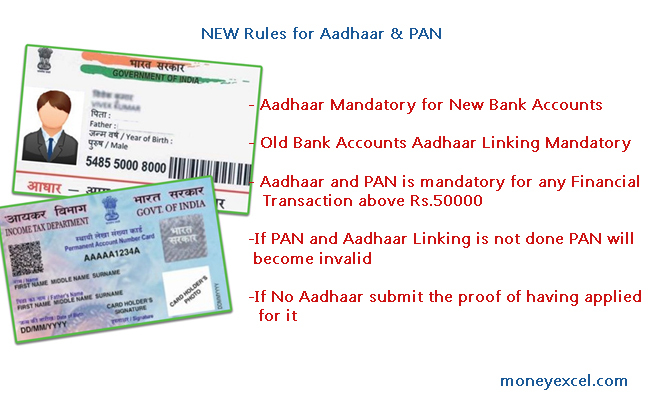 Your PAN card will become invalid if it is not linked with Aadhaar card (date is yet to be notified). Any individual holding PAN card needs to link it with Aadaar card irrespective of his/her income level or whether he/she files income tax return or not. This is as per section 139AA. The facility of linking Aadhaar with PAN is available on income tax portal. New Bank Account Opening – As per new rule, it is mandatory to produce Aadhar card number for opening saving or current account. In case you are not holding Aadhar card you need to produce enrollment slip stating you have applied for Aadhar. This rule is also applicable to Pradhan Mantri Jan Dhan Accounts that have less stringent KYC rules. Existing Bank Account holders – All existing bank account holders will have to link their accounts by providing 12 digit Aadhaar card number to the bank. The linking of bank account with Aadhaar should be over by December, 2017, failure in doing so will make your bank account invalid. Financial Transaction above Rs.50,000 – Any transaction above Rs.50,000 including investment in fixed deposit, mutual funds and insurance require Aadhaar and PAN both. This is to ensure tracking financial transaction via biometric identity. Even Aadhaar card is mandatory for International money transfer above Rs.50,000. PAN Card Application – Any individual applying for a PAN card after 1st July, 2017 needs to mention 12 digit Aadhaar card number or enrollment ID of Aadhaar in the application. Removal of fake and duplicate PAN card numbers from the system. New and old bank account can be tracked from a centralized system with Aadhaar enablement. All financial transaction shall be tracked in a biometric way. Transparent economy and eradication of black money. Enforcement in terms of prevention of money laundering. The Increase in tax compliance and tax revenue for the government. As per me, it is a welcome step by the government to curb black money and bringing the transparent system. Share your thoughts in the comment section below. nice summary. can u please share the source of the article like as per which rule ?! This is as per various news site like economic times etc.